Today, like yesterday, I have the flu! Please forgive any grammar or spelling mistakes as my head is very foggy. I am presently sitting on the back verandah, seemingly doing nothing at all. Well, at least anyone seeing me would think I was doing nothing but I know better! I am actually extremely busy. Busy thinking, reading poetry, watching all the wonderful wildlife go about their day to day business and studying the art of stillness. Every now and then I am so inspired by what I see that I write a little! Nothing mind blowing or important, just jottings like this one, inspired by the bull at the side fence. I call him Barney after Barney Rubble from The Flintstones TV show. (They share the same colouring, tone of voice and happy go lucky nature). Barney, like most of us, loves a good scratch. 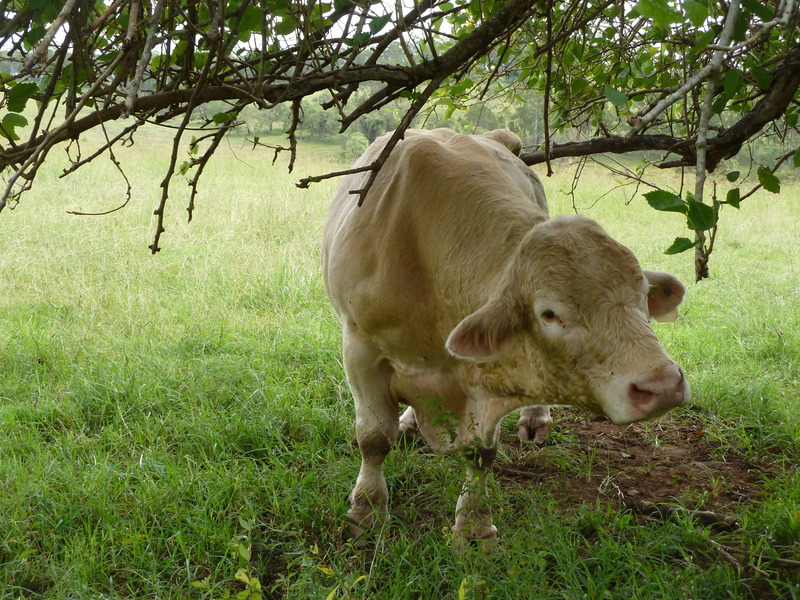 Years ago, when I first moved here, I would trim all the old broken and dead branches off the trees near the house, until one day I noticed that the cows and horses use them to scratch their backs on. No more trimming! The trees may look a mess but I love animals and would much rather them be happy than have a “pretty” garden. Barney came for his scratch today, but unfortunately, the wind in the last big storm had taken out the best scratching branch. Was Barney unhappy? Of course not ! He promptly set about setting up a new one, rubbing back and forth, head butting, chewing, until he had a new scratching branch that was just right! Then he scratched and scratched and scratched….and scratched some more. Occasionally he paused, assessed his success and then not satisfied, scratched some more. Scratching took place for a good 10 to 15 minutes, until, finally his itch was fully gone. Satisfied at last, he was free to go back to the serious business of eating. Barney had a wonderful time, I did too! Watching him had brought a smile to my face and I’m almost certain I saw a joyful smile on his face as well. Slowly, contentedly he ambled away, leaving me to reflect on a poem I had just encountered. The poem (by Lloyd Dobens) fitted so beautifully into the moment that I just had to share it. Hubby is at work today, so I decided to share it here. Sorry if it doesn’t seem to fit my site but for me it was a very enlightening moment, so in a way it is spiritual. as well as you can do it. Not done well enough yet! Still a slight tingle! More scratching required!